The paper and containerboard focused companies have had a reasonable start to the year, bouncing off some very low valuations, but they still look interesting to us and interesting relative to the rest of the broader packaging space. PKG has significantly outperformed the rest of the small group and we remain more focused on IP and to a lesser extent WRK based on valuation. IP remains our favorite, but WRK is also compelling. UFS also remains very inexpensive, has lagged this year and would likely respond very well to any change in trade flows related to free sheet. The other packaging names have the uncertainty of raw materials volatility and escalation, with metals pricing generally on a better trend and polyethylene likely to be more volatile over the next 18 months than it has been in a while – see recent research. The plastics packaging companies are generally expensive, possibly discounting the expectation of further plastics price decreases. US spot ethylene is already quite low and most large packaging buyers in the US buy on an ethylene based formula. This tailwind may be coming to an end. We are expecting volatility in ethylene and also its feedstocks over the next 12 months – this will mean raw material volatility for plastics packagers and volatile earnings also. Looking at forward consensus earnings growth versus PE ratios shows a bunch of stocks stuck at almost identical PE ratios but with very different growth expectations. This analysis would highlight the paper/containerboard companies, but especially WRK. It also justifies the appreciation year to date in PKG and suggests support at current levels. By comparison, BMS, SON and ATR look expensive. At the extremes, long WRK, short ATR looks like the best opportunity. 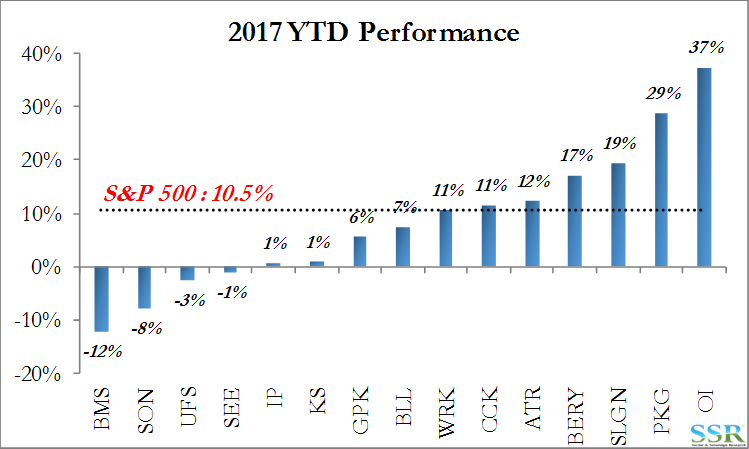 The Paper & Packaging space began 2017 as the cheapest sector in the Industrials & Materials group (excluding Metals) based on our return on capital-driven normal (mid-cycle) valuation models. 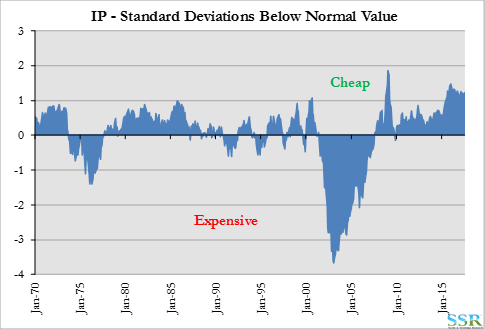 Several of the larger cap stocks remain cheap enough that the sector retains this discount, but the range of valuations in the subsector is shown in Exhibit 3, and necessitates a more selective approach. The real value is being driven by the discount in IP, which accounts for 25% of the market cap weighting in our Paper & Packaging index, and is the primary focus of the analysis below. UFS also shows a significant discount to normal value in Exhibit 2, but the stock has been range bound for several years as its main paper business continues to decline and the shift to pulp based consumer products has progressed slower than anticipated. 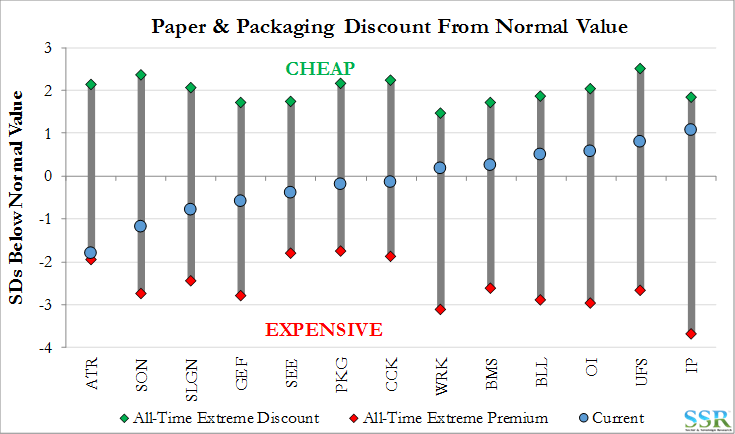 Other paper/paper packaging stocks include WRK, which is only marginally cheap on our analysis but significantly more interesting when comparing multiples to growth in the sector, and PKG which was a longtime favorite of ours within the group but has had a strong enough run in recent months that it is no longer attractive on valuation alone. 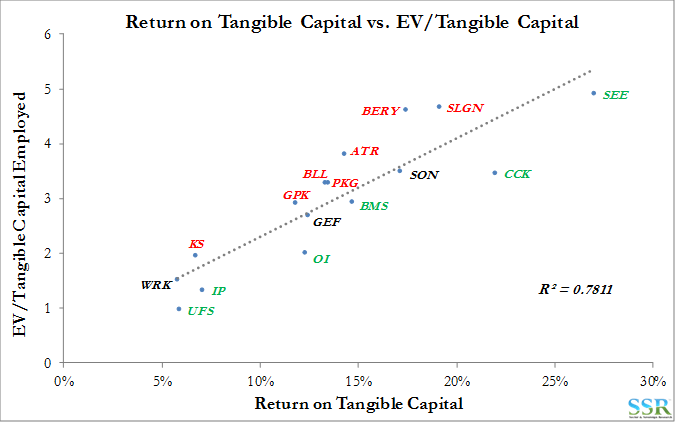 In Exhibit 4 we look at returns on tangible capital versus an enterprise value multiple of capital – companies below the trend line are under-valued relative to their returns versus peers. 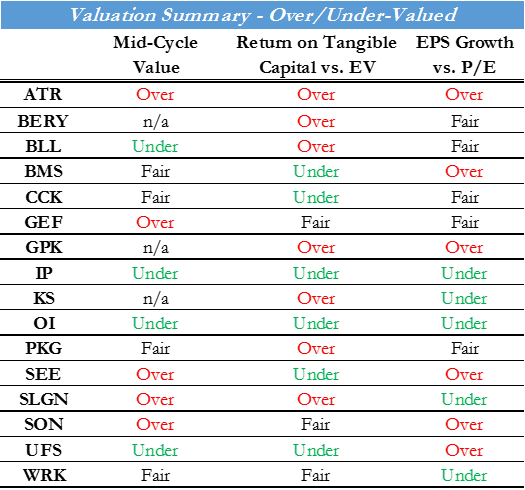 We show a summary of where the Paper & Packaging stocks sit on valuation metrics in Exhibit 5. The containerboard industry has undergone considerable consolidation in North America over the past 20 years – Exhibit 6. IP has gone from a secondary player to the market leader, and its share of the market (roughly one-third of supply) seemingly precludes its involvement in further consolidation. Yet other reasonably consolidated Materials industries that were thought to be beyond the point of allowable combinations have seen mega-mergers in recent years – BLL and Rexam in metal food and beverage packaging, and PX and Linde in industrial gas. Most of IP’s businesses are solid performers, the relatively small Consumer segment a notable laggard. 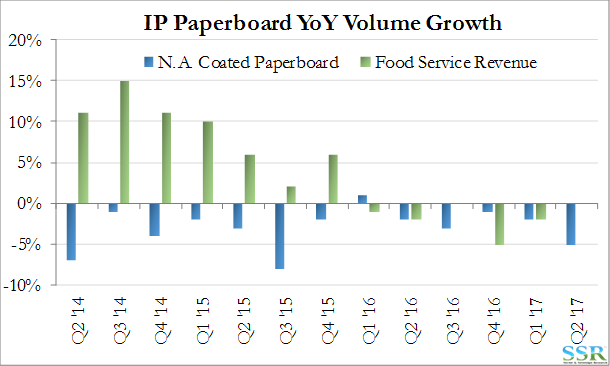 On the recent Q2 earnings call the company indicated that this business is being evaluated – this after last year’s conversion of paperboard capacity to produce fluff pulp. Moving to the level of competitor WRK’s consumer packaging business would help but this is a space that has recently shown a significantly lower margin profile than containerboard, and higher volatility than even the paper industry. IP might be better served to look for a buyer of this business – it is too small to be important to IP and is currently a distraction. 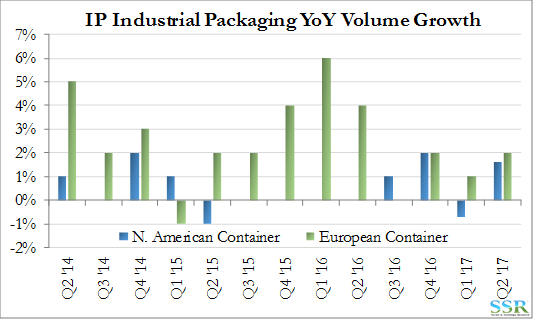 Digging into the individual segments – containerboard volumes in North America have picked up again after a flat four quarters from mid 2015-mid 2016. IP’s European business in this segment has been very strong. The box business in general has good growth prospects and containerboard operating rates in the US are in the high 90% range. 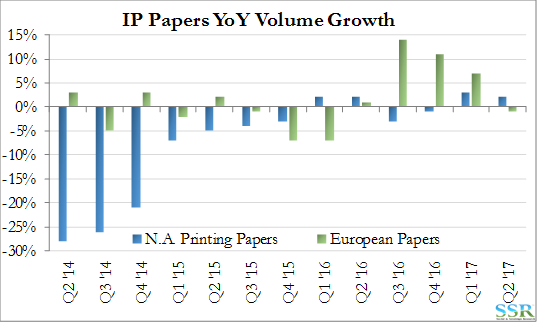 IP’s paper volumes appear to have stabilized after some significant declines related to the closure of a paper mill. Overall paper volumes in North America remain in decline but global volumes have shown surprising resilience – Exhibit 12. 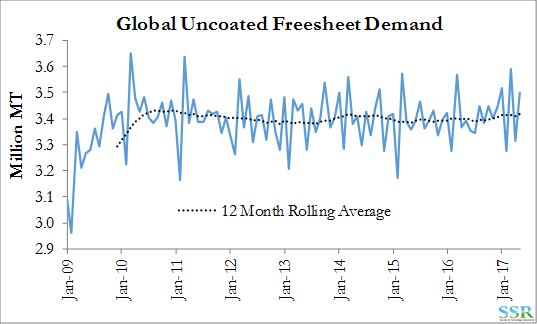 The consumer business has the most disappointing volume trends, driven partly the shift of capacity away from paperboard and toward pulp, and associated divestments. Food service previously saw strong gains due to a trend toward paperboard cups from Styrofoam but this appears to have been exhausted – Exhibit 13. The upside opportunity for IP – Exhibit 14 – is most significant on our normal valuation model, based on the return on capital trend shown in Exhibit 15. 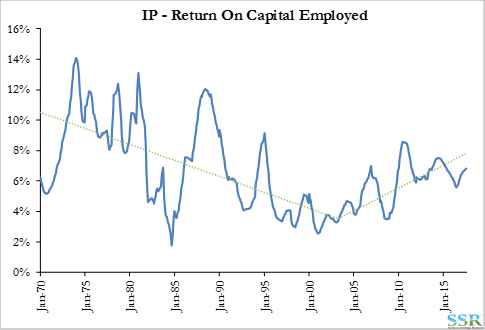 We could see a price close to $80 a share based on the normal earnings implied in the trend. 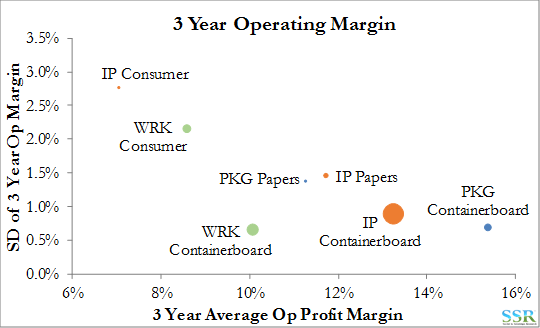 Alternatively, going back to the segment analysis in Exhibit 9, IP excluding its lagging Consumer business looks very similar to PKG – mid-teen margin containerboard businesses with legacy paper businesses providing cash flow. Forward growth rates, shown in Exhibit 1, are not dissimilar – 13% for IP over 2016-2018 vs. 16% for PKG. 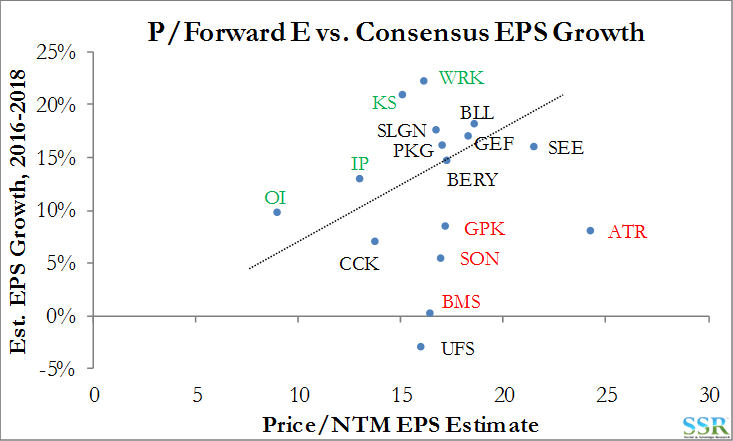 Yet the multiple divergence in the two names approaches four points on forward earnings. 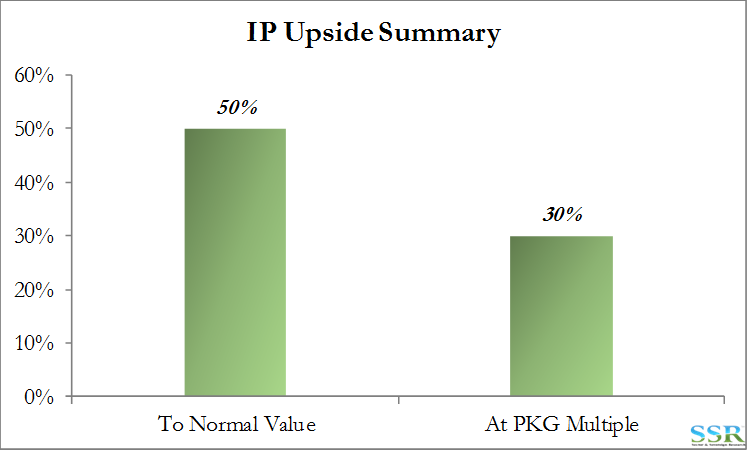 At PKG’s current multiple, IP would have 30% upside to its stock price.